In the 1930s, Mrs Arthur Webb was commissioned by the BBC to visit farms throughout the UK “in order to secure something that was characteristic of its cooking and preparation of food.” In much the same way as her contemporary, Dorothy Hartley, would – Mrs Webb tramped around the countryside conversing with farmers wives and watching them cook in their own kitchens, frequently with awe and respect. 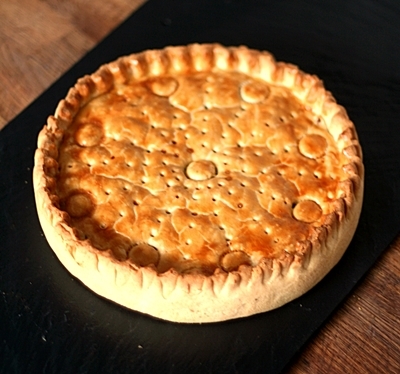 The pastry was crimped by laying the pastry lid so that the edges lay vertically against the sides of the tin. Insert the handle of a teaspoon between the outer edge of the pastry and the tin and your finger and thumb against the inside of the pastry. Press inwards with the spoon handle as you pinch the two pieces of pastry together. I had intended only to hand-crimp the tart edges, but the imprint of the teaspoon handle has made a pretty design, so I’m going to run with it. *lying* I totally meant to do that. The pattern was made firstly by gently pressing an apple-corer into the lid – enough to mark, but not enough to cut all the way through the pastry. Then I used a wooden skewer to poke holes in lines from the centre ring to each of the surrounding rings. Lastly I added a line of holes between each of these lines. These must be really dry. Definitely not fresh. If you have none to hand, nor any stale bread, make breadcrumbs of 3 slices of bread and lay them on a parchment-lined baking sheet. Dry (without browning) in a 120°C/100°C Fan oven for 20-30 minutes. Here’s a wonderfully aromatic and delicious dessert that I have adapted from a recipe that appears in Hannah Glasse’s “The art of cookery, made plain and easy”. It must have been popular, because Hannah gives no fewer than four recipes for Orange Pudding, each slightly different. Copyright infringement back then being rife, it is highly likely that Hannah is not the original author of this recipe, but I have yet to find an older version with these particular ingredients. Hannah calls this a pudding – and indeed it is certainly something that you might eat after lunch or dinner, but it is in fact what we would term a tart, and I can honestly say it is unlike any tart I’ve ever tasted before, for the very best of reasons. The most striking aspect is the flavour – a mixture of Seville orange, orange flower water, rosewater and white wine. Rather surprisingly, the word that popped into my head when breathing in its aroma was ice-cream – and that was before it was cooked! Once cooked and chilled, the flavours mingle together and taste extraordinary – the only way I can think to describe it is like plunging your face into a bunch of fresh flowers – but in a good way! This isn’t soapy/perfumed – it’s light and fresh and rounded. None of the flavours overpower, it’s just fantastically floral. One of the challenges when adapting old recipes, is that specific quantities are sometimes a bit of a challenge. This recipe is a good example, because amongst other things it calls for “the crumb of a halfpenny loaf”. Although food prices were relatively stable before the industrial revolution, wheat, and by extension bread, was especially subject to price fluctuations due to harvest yield. So much so, specific laws were created concerning the manufacture and sale of the various types of bread (The Assize of Bread) and books of tables drawn up specifying the size of loaves depending on the cost of wheat. Even with the Assize of Bread tables to hand, it’s still not clear which loaf the crumb should come from: white, wheaten or household. Household bread was the coarsest, and therefore unlikely, I reasoned, to have been used for such a delicate dessert. That left either white or wheaten and at just over 6oz and 9oz for a penny loaf, the difference in the quantity of crumb was going to be significant. The only solution was to make two tarts, and try each to see if one quantity was more suited than the other. The photograph at the top shows the result. The slice on the left was cut from a tart made with 150g fresh white breadcrumbs. The slice on the right from a tart made with just 100g. Personally, I prefer the one on the left – the texture is like baked cheesecake, but not heavy and cloying. The slice on the right has a much softer consistency – if you’re a fan of baked custards, then this is the one for you. For an even more delicate texture, you could even try with just 50g of breadcrumbs – do let me know if you try this! This is a wonderful springtime tart and I really hope you’ll give it a try. Put all the ingredients except the water into the bowl of a food processor and blitz until the mixture comes together in a ball. If the mixture is too dry, add some ice cold water 1 tablespoon at a time until the pastry forms a ball. Grease a 22cm fluted, deep, loose-bottom tart tin – a lemon meringue tin if you have one, is ideal. Remove the chilled pastry from the fridge and place on a floured surface. Roll out thinly (7-8mm) and line the prepared tin, gently easing the pastry into the sides. Let the excess pastry hang over the sides of the tin for now. Prick the bottom of the pastry with a fork and put the lined tin back into the fridge to chill for another 30 minutes. Remove the tart from the fridge and trim the excess pastry. Don’t remove too much – allow 3-4cm to overhand the side of the tin – this keeps the pastry from shrinking back into the tin and can be trimmed after cooking. Line the pastry with baking parchment and fill with baking beads/beans/rice. Bake for 12 minutes, then remove the parchment and beads and bake for another 5-6 minutes until the pastry is cooked through. Brush the inside of the pastry with lightly beaten egg-white and return to the oven for 5 minutes. This seems like a faff, but it will ensure you pastry is both cooked AND resistant to the wetness of the filling until it is cooked. *lying* I deliberately undercooked the pastry on the left in the photo to demonstrate. Mix all of the ingredients together in a bowl and set aside to let the flavours mingle. It will have the consistency of porridge. When the pastry base is finally cooked, turn the oven down to 160°C, 140°C Fan. Cover the top edges of the pastry with tin foil, to prevent them from burning. Pour the filling into the cooked pastry case and bake for 25-30 minutes until the filling is set. There should be a slight joggle to the middle of the tart, but nothing too fluid. Set aside to cool for at least 1 hour. When cold, trim off the excess pastry, remove from the tin and place on a serving plate. Eat slightly warm or at room temperature. Alternatively (and my own personal preference) chill thoroughly in the fridge for at least 5 hours. The original recipe called for sack, a fortified wine similar to sweet sherry. You could use sherry, madeira even marsala if you like. Whilst I love the flavours of all three, I thought them a little rich for this recipe, so I chose a regular white wine. A sweet and aromatic dessert wine would also be delightful. Both of these fragrances are available in the baking aisle at the supermarket. They also tend to vary greatly in strength and aroma according to which brand you use. The original recipe called for equal quantities of both, but the rosewater I use is rather strong. In contrast, the orange flower water that I use is rather lightly perfumed, so I used slightly more. if you use different brands, my advice is to use just 1 teaspoon at a time and taste as you go until you’re happy with the flavourings. If, like me, you made Seville orange ice cubes with the zest and juice back in January, then all you need is one cube. If not, then use the zest only of a sweet orange, together with the zest of either a lemon or lime for added sharpness. I’d just like to take a moment to discuss a modern British classic pudding: Banoffi Pie.